When you play Arcanine from your hand to evolve your Active Pokemon, you may flip 3 coins. For each heads, choose a basic energy card from your discard pile and attach it to Arcanine. Your opponent switches the Defending Pokemon with 1 of his or her Benched Pokemon, if any. 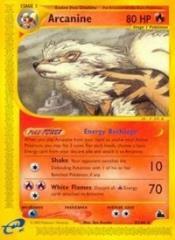 Discard all Fire Energy cards attached to Arcanine.